Autodesk just released AutoCAD 2019 for Mac for all customers with a current subscription to AutoCAD. Like its Windows counterpart released in March, the new AutoCAD for Mac brings many of the AutoCAD 2019 (for Windows) features to Mac while maintaining a native macOS experience. Before we explore what’s new in this release, let us address the elephant in the room regarding the timing of this update. While it may seem this update is eight months late, it’s actually right on schedule. Unlike the Windows version Autodesk typically updates in the spring, the Mac version typically follows Apple’s macOS update cycle. As Mac users indubitably know, Apple released macOS X 10.14 (Mojave) at the end of September. On the heels of that release, AutoCAD for Mac 2019 natively supports the latest version of macOS X without the need for any patches. Have you ever had two versions of the same drawing and needed to identify what changed between revisions? Without a native solution, the best we could do on Mac was XREF the drawings together and manually identify what had changed. Like its Windows counterpart, AutoCAD 2019 for Mac brings the popular, not to mention immensely useful drawing compare feature to macOS X. Identifying differences between two drawings is as simple as loading them into drawing compare. With drawing compare, everything in your drawing will change to 1 of 3 user definable colors (regardless of layer properties). The colors represent geometry that is unchanged between both drawings, geometry that exists in Drawing A but not Drawing B, and finally geometry that exists in Drawing B but not Drawing A. Beyond just identifying what’s changed between drawings, the tool will also place revision clouds (whose tolerance is adjustable) around the changes in your drawing. The view and viewport improvements are another feature that will be instantly familiar to anyone with experience using AutoCAD 2019 (for Windows). Although it’s still possible to create Layout Viewports using conventional workflows, the view and viewport enhancements greatly simplify the process. As viewports are inherently related to Model Space, it makes sense for the process to begin there as well. That’s precisely what these improvements do. Create any number of Views from Model Space and each is added to the View Gallery. When the time comes to create sheets (Layouts), just choose the view you would like to place from the View Gallery. AutoCAD chooses a scale (that you can override) it determines best fits onto your sheet, and with a single click, the View is placed as a Viewport on your Layout tab. Need to change a Viewport scale after it’s already placed on your sheet? Just select the viewport to display its grips. A new triangle grip displays near the center. Choosing it will let you choose a different scale. Most notably, AutoCAD maintains the visible area of the Viewport when using the scale grip. 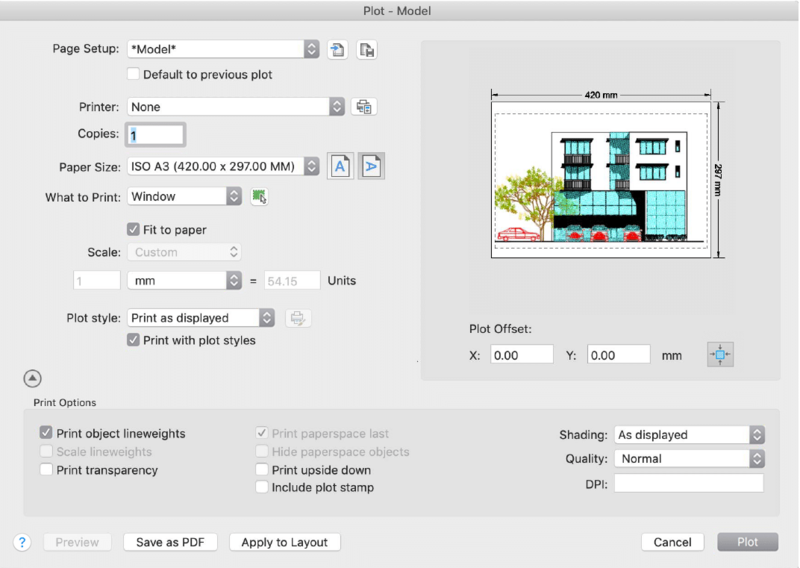 Although all the plotting options available in AutoCAD 2019 for Mac remain, the overall layout of the Plotting dialog box is updated in 2019. More specifically, the most used plotting options display by default with lesser used options available by expanding the disclosure triangle at the bottom of the dialog box. One new feature of plotting in AutoCAD 2019 for Mac is the addition of a Plot Preview. You no longer need to plot and pray. Instead, you can now see how your plot will look well before you press the plot button. 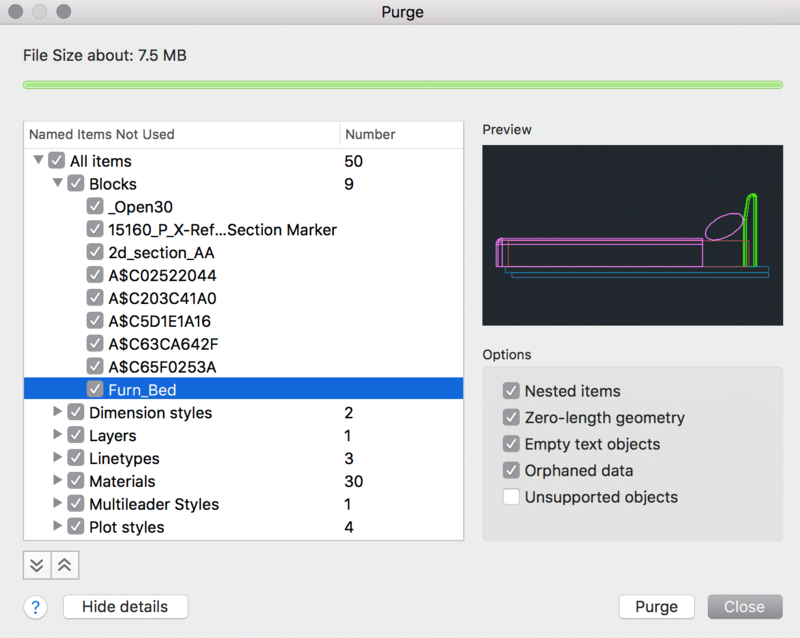 The PURGE command has always existed in AutoCAD for Mac – it just didn’t have a user interface. The PURGE command was a command-line only command. That all changes with AutoCAD 2019 for Mac. The Purge dialog box mimics the functionality of AutoCAD (for Windows) with a few bonuses. Those bonuses include a File Size graph. With it, you can quickly determine how purging an item will impact the file size of your drawing file. Another helpful feature is the inclusion of a preview. For example, when you select a block to purge, a preview of that block displays on the right side of the dialog box. It’s not an uncommon practice to override Layer properties for XREF’s. For example, you may choose to change the color of a drawing used as a background so it’s screened by a percentage when plotted. When you perform such overrides in AutoCAD for Mac, a Layer filter is automatically created. All layers with one or more override properties display in this group. Beyond just identifying layers with overridden layer properties, performing a secondary-click on a layer name gives you the option to reset all Layer properties or just one property (like color or linetype) at a time. Another welcome addition to XREFS in AutoCAD for Mac is the ability to define a default External Reference Layer. Once defined, AutoCAD places all XREFs on the layer you specify. 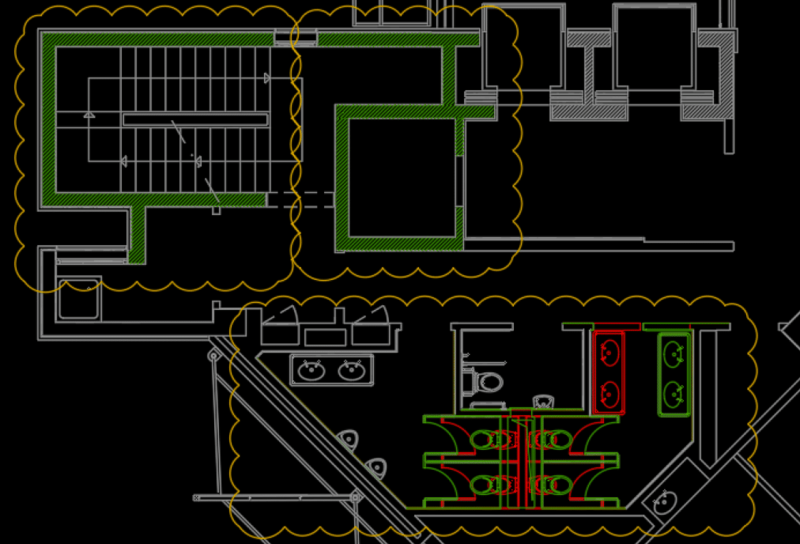 If the layer doesn’t exist in the current drawing – AutoCAD will create it for you. AutoCAD 2019 for Mac introduces several new productivity tools to AutoCAD while maintaining a native macOS X experience. Tools like Drawing Compare make the design process easier by allowing you to quickly understand what’s changed between two drawings and understand how those changes might impact your design. The new views and viewport enhancements bring introduce a more intuitive workflow for defining and placing viewports onto sheets (Layout Tabs). The ability to more easily identify and take action on XREF layer overrides makes working with production sets in AutoCAD for Mac easier than ever. Are you an AutoCAD for Mac user? Let us know about your favorite AutoCAD 2019 for Mac new feature in the comments section below. Need Help Running Autodesk Software on a Mac? Let our team of experts help you evaluate how best to run Autodesk software on a Mac based on your project objectives. Why is my AutoCAD Civil 3D drawing so slow?